A budding writer from Lahore visits the city of his beloved author. The ignorant Delhi wallas often view visiting Pakistanis as ISI agents or trouble-makers. Mr. Raza Rumi, a native of Lahore, is neither. He has no beard, no moustache. He never frowns, he smiles (actually, he smiles a lot). He has a sleek laptop, no Kalashnikov. Yet he set the city on fire. 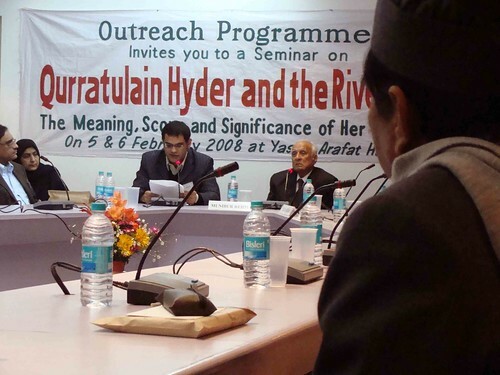 As Pakistan’s celebrated blogger, he was invited by Jamia Millia Islamia University to speak on a seminar on the Urdu novelist Qurratulain Hyder. Mr. Rumi came, read, and well…conquered. After the Jamia conference, Mr. Rumi, also a budding writer, went to the Jamia Nagar kabristan and stood silently by Ms. Hyder’s grave. …… Hyder, till her last, remained a unique bond between India and Pakistan. She was a regular visitor in Pakistan that was her second home in actual terms. Her family, friends and admirers were in a large number that never distanced her from Pakistan. Like her characters, she traveled, migrated and re-migrated and became a chronicler of our times, not as a historian but as a fiction writer. In the following days, The Delhi Walla was amused by interesting conversations with Mr. Rumi. This Pakistani can speak for hours, sometimes a little self-conscious, but mostly laced with stories that are quite entertaining. During his last trip to the city, Mr. Rumi had gone to Urdu Bazaar, near Jama Masjid, to buy Kaf-e-Gul Farosh – Ms. Hyder’s hefty two-volume pictorial autobiography. Its steep price did not matter. He has always been Ms. Hyder’s devoted reader and considers himself lucky to have met her in person. During his first trip to the city, 3 years ago, a close friend took him to Ms. Hyder’s residence in Noida where he presented rajnigandha flowers to her, along with a few cassettes of some obscure thumri singers. This does not mean that Mr. Rumi is always lucky. He regrets that he had the ill-luck to born a little too late to meet another outstanding Delhi resident he admires – Mirza Ghalib. The greatest of Urdu poets, to use Mr. Rumi’s hyperbole, died 99 years before he was born. But Mr. Rumi cannot be blamed for not doing what is proper. He always read the fatiha as he passes by Ghalib’s tomb that falls on the way to Nizamuddin dargah. By the way, this sufi shrine is Mr. Rumi’s favorite Delhi haunt. Within the shrine lies the tomb of Jahanara, Shahjahan’s daughter. This Mughal princess had requested that no roof should be erected above her burial place. Only grass grows there. Mr. Rumi considers her as a woman sufi and likes sitting next to her tomb. This may be a flattering portrait of Mr. Rumi as a devotee of the Sufis. Alas, he can be a clichéd tourist too. As he related, he also loves to haggle with the Kashmiri carpet sellers, find bargains in the Dilli Haat, and fill a sack full clay crafts from rural India. And above all, he, quite smoothly, enters the Humayun’s tomb as a local (remember, foreigners are charged in dollars). Of course, who would doubt his chaste Lucknow inspired Urdu. Sometimes Mr. Rumi behaves like a typical Delhi intellectual: arranging rendezvous in IIC, meeting friends in Café Turtle, and buying books in Khan Market. Not to mention attending high profile events with his dear friend Ms. Sadia Dehlvi. But the devotion to Hazrat Nizamuddin Auliya and the music of Amir Khusrau brings him back, again and again, to the Bastee that he calls the spiritual ghetto–a little haven of peace amidst the maddening commercialism of Delhi. Not unlike his views on Ms. Hyder whom he calls a “a dual citizen in an age where acrimonies of Partition and officialdom have made it impossible to hold concurrent citizenships”, Mr. Rumi has not entered the Delhi scene. We hope that like his inspiration, Ms. Hyder, he can defy these official restrictions not by breaking any law but espousing a sense of “belonging” that needs no passports. If Raza Rumi likes Delhi so much why he doesn’t annul his Pakistani citizenship and come to delhi. <>The ignorant Delhi wallas mostly view visiting Pakistanis as ISI agents or trouble-makers. Mr. Raza Rumi, a native of Lahore, is neither.<>Are you sure? Just joking. Great piece. Its a really well researched and well written piece. Very informative indeed! The pics are also awesome. Kudos, Mayank! non-residents falling in love with a city is always a good sign…and the reasons for mr. rumi’s love make it even better. Its so easy to fall in love with Delhi…ask a Delhi Walli who is estranged from her home. And Mr Rumi just proves that borders are easy to transcend for a music, poetry and history lover…I am all nostalgic! This piece just reinforces that the cultural connections between India and Pakistan are too intertwined to be affected by geographical borders. Totally loved the article. The piece is very enlightening. I have lived in Delhi all my life but I love the way every article on this site Subtly unravels new sights, sounds and experiences of Delhi. keep it up! Nice article, got as a forward from a friend, keep the good work going, would have been interested in knowing Mr Rumi’s opinion on controversial topics as a pakistani intellectual also. Nice post, except for the opening paragraph. Sometimes, to repeat a cliche only serves to strengthen it. Wow!! Delhi seems to be a real nice place. and quite similar to pakistan. The way visiting and paying homage to “shrines” is mentioned in here, it looks like u are standing in Lahore at the Data Darbar which is, as you might have heard, a pretty popluar Pakistani place to visit in this respect.Secondly, cultural connections between the two countries do seem very likely to have that “potential” if explored and carried out properly! Overall, a great piece!! May Raza’s ability to inspire grow. Great going, Mr. Raza Rumi. May your tribe increase. This is one of the best profiles I have seen for a long time in this wonderful blog.